No need to set up a blog somewhere else. Every Selz store comes with a powerful, fully-featured blog, all within the streamlined Selz interface. Use your blog to publish content that is relevant to your customers and improve your SEO. As the saying goes: content is king. Blogs and ecommerce go hand-in-hand. Our online stores with their powerful built-in blogging capabilities are a great way to build your business. Having your blog built into your store makes it easy to maintain, with no extra hosting costs or accounts required. Customize your page slugs, page titles and meta descriptions or just click the switch and let us optimise the SEO for you automatically. Why is a blog is so important for your online store? A blog helps you grow personality as an online brand. It's a place you can share behind-the-scenes stories with your audience and customers. 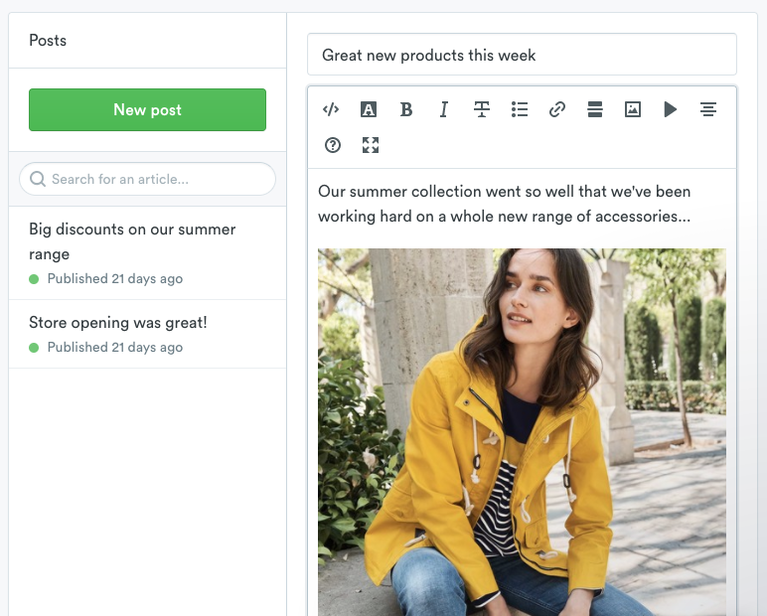 Blogging with your online store gives you the chance to connect with your audience and customers without openly selling. Blogs are an important part of your online store. They can be a showcase for recent product and service releases. They are places to advertise promotions and discounts. Every Selz store comes with a fully integrated and SEO optimised blog. So start connecting with your customers today.